"Weird Tales was the archetypically Gothic pulp magazine . . . . H.P. Lovecraft, of course, is as pure an instance of the Gothic writer as can be found in this century. . . ."
The Gothic may be seen as a reaction to the emphasis on reason which prevailed in the Enlightenment . . . . In a world ruled by Order . . . some room needed to be left for mystery, the marvellous [sic], the evil, the inexplicable. Usage of the term "Gothic" in literature derives from The Castle of Otranto by Horace Walpole, tellingly subtitled "A Gothic Story" and published in 1764. (1) With its "frightened heroines, unseen horrors, and ghostly visitations in gloom-ridden medieval architecture," The Castle of Otranto inspired a trend that carried on into the nineteenth century. (2) Even a novel such as Jane Eyre, from almost a century later, has its Gothic elements. After the publication of The Castle of Otranto, novel after Gothic novel (or perhaps more accurately in literary terms, romance after Gothic romance) came off the printing press: Vathek (1784) by William Beckford, The Mysteries of Udolpho (1794) by Mrs. Ann Radcliffe, The Monk (1796) by M.G. Lewis, Zofloya (1806) by Charlotte Dacre, Melmoth the Wanderer (1820) by Rev. Charles Maturin. In Frankenstein (1817), Mary Wollstonecraft Shelley married science and Gothicism, thereby writing what some consider the first science fiction novel but in the form of a Gothic romance. (3) In writing that novel, Mary Shelley seems to have attacked a problem, namely, how does the artist reconcile Gothicism--"a reaction to the emphasis on reason"--with modern science, a product of reason? 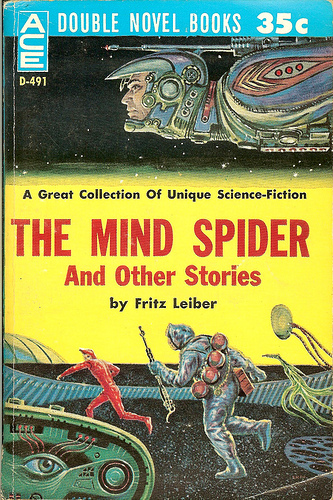 Fritz Leiber--a writer of both fantasy and science fiction--ran into the same kind of problem at the outset of his career. Leiber had more to deal with though, for the twentieth century was a century fully under the sway of science, reason, and materialism; a century of increasing urbanization, industrialization, and mechanization; a century of isolation, alienation, and existential anxiety, if not existential horrors. The upshot of all this is that weird fiction, woven from threads of nineteenth century fantasy, eighteenth century Gothic romance, and earlier stories of ghosts, vampires, witches, and werewolves, is essentially Medieval (and European), whether in descent through folk culture or in modern reaction to the higher culture of literature, art, science, and philosophy. The question for the writer of weird fiction is this: How do I write a tale from Medieval times when the world is no longer Medieval in nature? Better yet: How can the weird tale be relevant in a material age? (1) According to Peter Haining in The Art of Horror Stories (1986), The Castle of Otranto was published on Christmas Eve 1764. In other words, Fritz Leiber, Jr. and the Gothic novel came into the world on the same day, separated by 146 years. (2) Quoted from Alternate Worlds: The Illustrated History of Science Fiction (1975) by James Gunn. Mr. Gunn took note of the then-recent revival of Gothic fiction. He was probably referring to romance novels, but there were Gothic revivals in other media as well, such as in Dan Curtis' television series Dark Shadows (1966-1971). It's interesting to note that the 1960s and '70s revival of Gothicism coincides pretty well with a renewed interest in pulp fiction and fantasy, especially the work of Robert E. Howard, H.P. Lovecraft, and J.R.R. Tolkein. (3) Significantly, that novel came out of a contest (among the Shelleys, Lord Byron, and Dr. Polidari) to write a ghost story. As Fritz Leiber's fictional character from over a century later said, "Each culture creates its own ghosts" (from "The Hound" in Weird Tales, Nov. 1942). (4) Quoted from the Wikipedia article, "Pre-Raphaelite Brotherhood." (5) Edgar Allan Poe died in 1849, a year after the founding of the Pre-Raphelite Brotherhood and about halfway between the publication of The Castle of Otranto (1764) and the first issue of Weird Tales (1923). 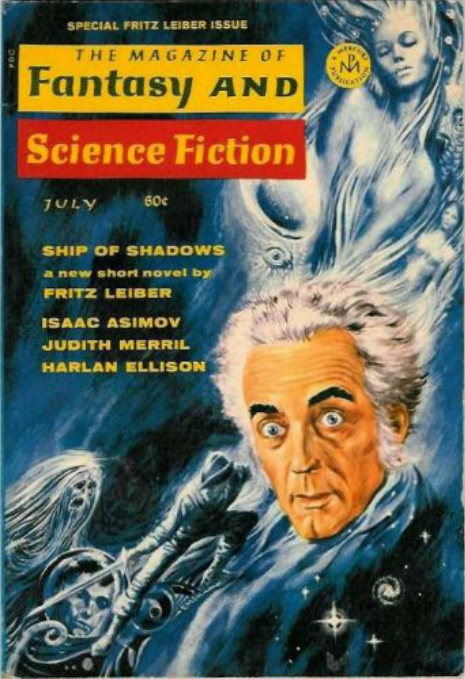 Fritz Leiber, Jr. was twenty-eight years old when he sold his first fantasy story to Unknown. "Two Sought Adventure," a tale of Fafhrd and the Gray Mouser set in an imaginary land, appeared on the newsstand in August 1939, only a few weeks before the Nazis launched their attack on Poland, thereby propelling the world into war. Leiber's first story for Weird Tales, "The Automatic Pistol"--a sort-of Damon Runyon story written as weird fiction--followed in May 1940 at about the time the Sitzkrieg came to an end. In the little world of fantasy, a new master was making his debut. In the world at large, new horrors were being unleashed, the horrors of perfect order, of the totalitarian state on the march, of the attempted eradication of the individual and the extermination of whole peoples. (1) If war is the health of the State, then the State would enjoy a hale and hearty condition not just until 1945, but in some quarters for decades to come. May 1940 also marked the end of an era at Weird Tales--and the beginning of another. Farnsworth Wright (1888-1940) had been at the helm of "The Unique Magazine" since 1924, guiding it through what many consider its golden age. During the 1920s and '30s, Wright's stable of writers included H.P. Lovecraft, Robert E. Howard, Clark Ashton Smith, Seabury Quinn, Edmond Hamilton, E. Hoffman Price, C.L. Moore, and many others. On the strength of its editor and contributors, Weird Tales enjoyed a rare status among pulp magazines: a reputation for quality if not excellence. Other publishers launched their own magazines of fantasy and weird fiction in obvious imitation. Chief among them was John W. Campbell's Unknown, the magazine that printed Fritz Leiber's first story. The debut of Unknown was not the first crack in the Weird Tales edifice. In 1938, the magazine had moved from its longtime Chicago home to a new publisher in Manhattan. In May 1940, Dorothy McIlwraith took over editorship of the magazine and Farnsworth Wright went into retirement. Before the year ended he would be in his grave. Weird Tales began in March 1923, launched by J.C. Henneberger, a fan of Edgar Allan Poe and a publisher who wanted to give prominent writers an outlet for stories of the fantastic. "When everything is properly weighed," Henneberger wrote, "I must confess that the main motive in establishing Weird Tales was to give the writer free rein to express his innermost feelings in a matter befitting great literature." (2) Hamlin Garland, Ben Hecht, and Emerson Hough were on Henneberger's list of potential contributors to his new magazine. However, Weird Tales turned into something different than he imagined and none of those men ever wrote for the magazine. Instead--luckily for fantasy fans then and now--we have the works of Lovecraft, Howard, and all the rest. a mix of any of these types. Although some might be traced back to Poe (science fiction, detective), most of these types are ancient or Medieval in origin. For example, ghosts, monsters, dreamscapes, and other fantasies and horrors have probably been around for as long as people have been telling stories. But even a type as recent in its origins as the heroic fantasy is more or less an old kind of tale. Conan's Hyperborean world after all is simply a mix of Medieval, Classical, and prehistoric Europe, with a bit of the Orient, tropical Africa, and pirates of the Caribbean thrown in for good measure. The problem with the weird tale, then--especially as world war loomed in 1939 and raged until 1945--is this: How do you bring a story that is basically rural and Medieval in origin into an urban, industrial, materialist twentieth century? 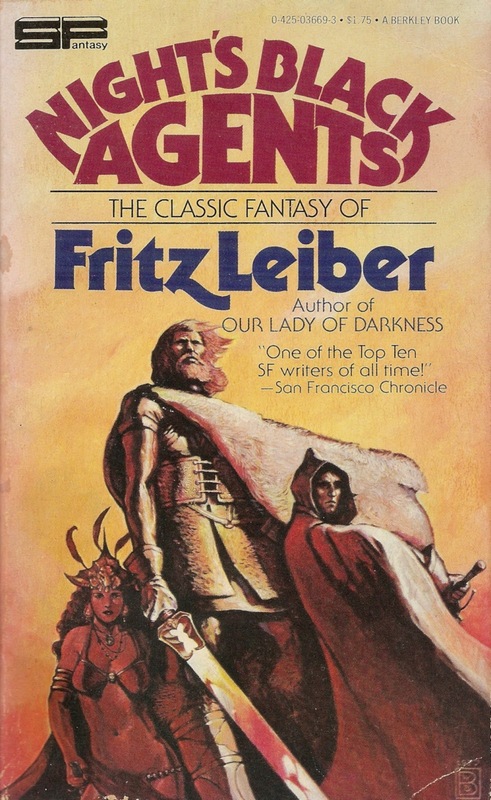 That was a problem that Fritz Leiber--if no one else--faced as he began his career as a writer of fantasy stories. (1) In all those things except for perhaps the first, the Nazis would have found precedent in the Soviet regime and would have been equaled by or beaten at their game by the Communists. (2) Quoted in The Weird Tales Story (1977) by Robert Weinberg, p. 3. Fritz Reuter Leiber, Jr., was born on Christmas Eve 1910 in Chicago. He was the son of the actor Fritz Leiber, Sr., and the actress Virginia Bronson. For a time, Junior entertained thoughts of being an actor as well. He acted on stage and appeared with his father in the movies Camille (1936) and The Great Garrick (1937). Fritz Leiber, Jr., also acted in the 1947 thriller The Web, and Equinox, a horror movie from 1970 with Frank Bonner, later Herb Tarlek of WKRP in Cincinnati. Like H.P. Lovecraft, Leiber lived with his two aunts, though also with his parents. Studious and retiring, he graduated from the University of Chicago in 1932 with a Bachelor of Philosophy degree and with honors. He followed that up with studies at the General Theological Seminary in Manhattan and work as a lay preacher, as an editor of encyclopedias, and as a teacher at Occidental College in Los Angeles. During World War II, Leiber worked in an aircraft plant. Afterwards he became an editor for Science Digest, the most enduring job he ever held. In the early 1960s, Leiber ghosted a year's worth of continuities for the Buck Rogers comic strip. Leiber's career in science fiction and fantasy began with "Two Sought Adventure," a story of Fafhrd and the Gray Mouser in Unknown (Aug. 1939). His writing career spanned half a century, during which time Leiber won many Hugo, Nebula, and other awards. Along with Robert Bloch and Ray Bradbury, Leiber was one of the star writers who contributed to Weird Tales during the 1940s. His stories were few--eight in all--but they were enough to earn him a hardcover edition in 1947 under the Arkham House imprint. It was his first book. Dozens more followed. A champion chess player and fencer, Leiber endured ups and downs of poverty, addiction, alcoholism, and the loss of his wife. Despite that, we can call his life a triumph. I hope he felt the same way. 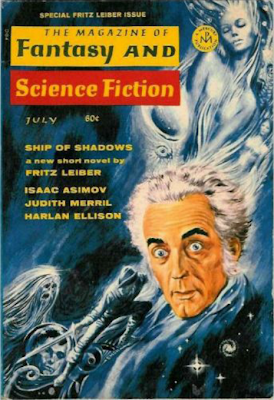 Fritz Leiber, Jr., died on September 5, 1992, in San Francisco. He was eighty-one years old. 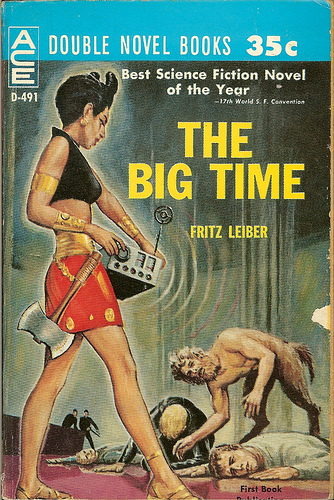 There's no shortage of reading on Fritz Leiber and his work. I found some of the information for this posting in Seekers of Tomorrow by Sam Moskowitz (1966). The Girl with the Hungry Eyes and Other Stories, an Avon book from 1949 with a cover by an unknown artist. Other authors in the collection: William Tenn, August Derleth, P. Schuyler Miller, Frank Belknap Long, and Manly Wade Wellman. The Big Time, one side of an Ace Double. The cover of this book is one of the reasons why people read science fiction. The artist was Ed Emshwiller, aka Emsh. And here's the other side, with art again by Emsh. Fantastic Stories of Imagination from August 1963 featuring a Grey Mouser story. The cover artist was Vernon Kramer. Ed Emsh was back to create this cover of a special Fritz Leiber issue of The Magazine of Fantasy and Science Fiction (July 1969). 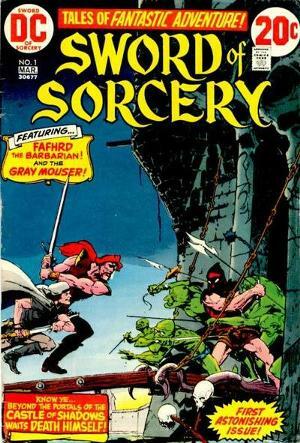 In 1973, DC published five issues of Sword of Sorcery, adapting Leiber's Fafhrd and Gray Mouser stories to the comics. 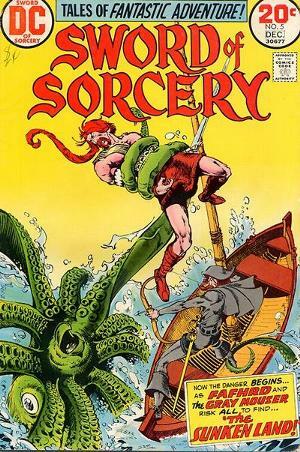 Michael Kaluta created the cover for the first issue, one that may owe a little to Hal Foster. Howard Chaykin and Bernie Wrightson contributed the cover to the second issue. Howard Chaykin penciled the cover art for the third issue. The Grand Comics Database believes Vincente Alcazar may have been the inker. Chaykin and another unknown inker--possibly Walt Simonson--created the fourth cover in the series. 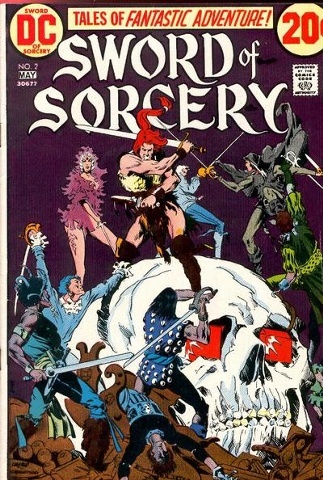 Walt Simonson was the artist on the fifth and last issue of Sword of Sorcery. 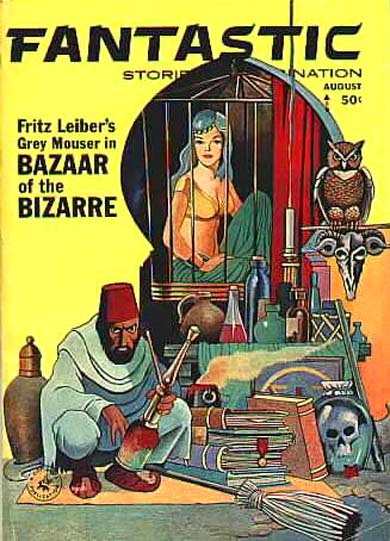 Despite their short run in the comics, Fafhrd and the Gray Mouser continued their adventures in a world imagined by Fritz Leiber. Labels: Authors, Authors of the Golden Age of Science Fiction, Fritz Leiber Jr.
Night's Black Agents by Fritz Leiber, Jr. If you're feeling nostalgic for the 1940s, you might find a cure for what ails you in Night's Black Agents, a collection of short stories by Fritz Leiber, Jr. War and the specter of war figure prominently in these stories. Perhaps more central to Night's Black Agents is the city itself, a dirty, dark, and dingy place, full of soot, grit, dust, and noise, a place of failing light and full of lonely streets, rooftops, offices, and rooming houses. This is the landscape of urban industry, a kind of landscape that was then new to the world (or no more than a century old), new also to the weird tale. I'll write more about that in a future posting called "Fritz Leiber and the Problem of the Weird Tale." First things first, though. 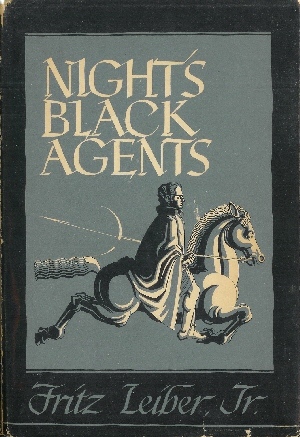 Night's Black Agents in the Berkeley Books edition of 1978 is a collection of dozen stories published between 1940 and 1962. The book was first published under the same title in 1947 by Arkham House. The earlier edition included ten stories and a foreword. Berkeley added "The Girl with the Hungry Eyes" and "A Bit of the Dark World." It's an odd mix: there are two tales of heroic fantasy starring Fafhrd and the Gray Mouser ("The Sunken Land" and "Adept's Gambit") and a brief, somber, bittersweet fable published in the aftermath of World War II ("The Man Who Never Grew Young"). The core of the book is a collection within a collection labeled "Modern Horrors." Of the nine stories in this section, three were first printed in Weird Tales. 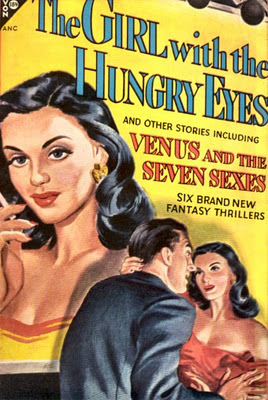 Also included in "Modern Horrors" is "The Girl with the Hungry Eyes," the only story in the book to have been adapted to film. (1) The final story, "A Bit of the Dark World," published in 1962, might easily have been called "A Bit of Phantasmagoria." Mature and sophisticated, it's a story well worth reading. (1) "The Girl with the Hungry Eyes" was first filmed as a segment of Rod Serling's Night Gallery in 1972, then as a feature length movie in 1995. Night's Black Agents (Arkham House, 1947), with cover art by Weird Tales artist Ronald Clyne. There were only 3,084 copies of this book printed. The Berkeley edition from 1978 with added contents. The cover artist was Wayne Douglas Barlowe. Thanks to Michael Gage for pointing that out. That's the blurb inside the front cover of The Spell of Seven, L. Sprague de Camp's 1965 companion volume to Swords & Sorcery. The format was the same as before: cover art and interior art by Virgil Finlay, introductions to the book and to each story by de Camp, and a collection of tales from Weird Tales and other magazines, all in the genre of heroic fantasy. Dunsany, Howard, Smith, and Leiber are here, but so are then-younger writers Jack Vance and Michael Moorcock. There are seven stories in all, only two of which originally appeared in Weird Tales. 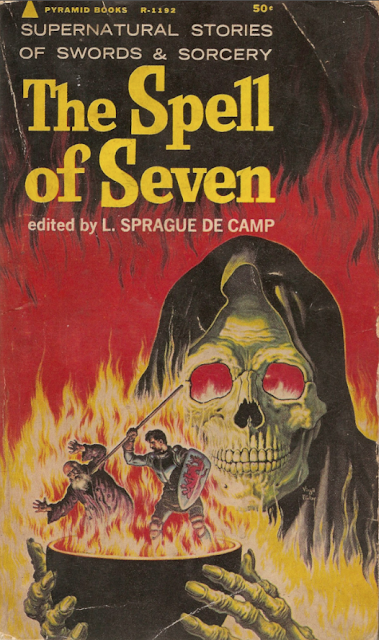 The Spell of Seven (Pyramid Books R-1192). Cover art by Virgil Finlay. 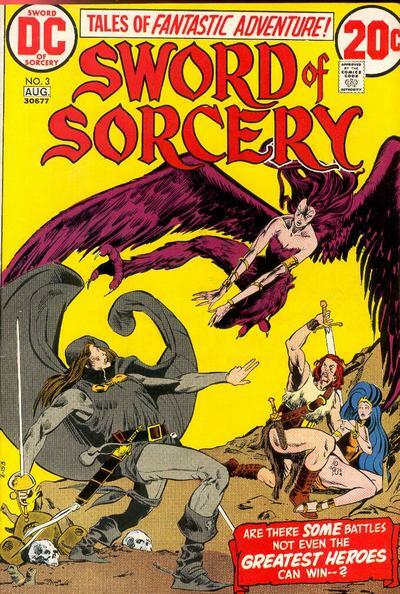 Weird Tales was a pioneer in the sub-genre of fantasy known as heroic fiction, or as in the title of a 1963 collection from Pyramid Books, sword and sorcery. The magazine's chief practitioner of heroic fiction--and arguably the inventor of the sub-genre as most know it today--was Robert E. Howard. His principal character was of course Conan the Cimmerian, that "dark-haired, sullen-eyed" swordsman from before the last glaciation. 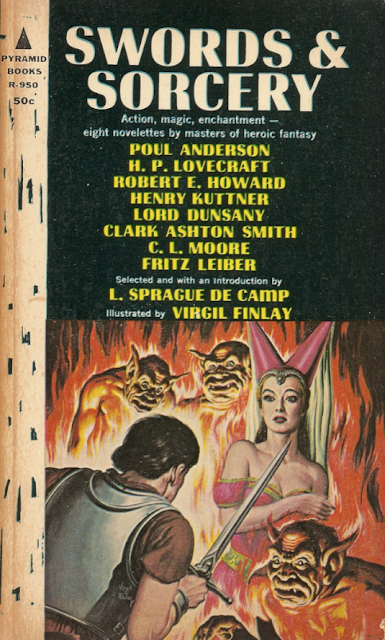 Other authors of heroic fiction included Clark Ashton Smith and C.L. Moore, creator of the first heroic female protagonist, Jirel of Joiry. The editor of Swords & Sorcery was that bur-under-the-blanket of all Howard and Lovecraft fans, L. Sprague de Camp. De Camp was known to have written a few sword and sorcery tales in his own time. He also authored a study of figures in the field, entitled--what else--Literary Swordsmen and Sorcerers: The Makers of Heroic Fantasy (Arkham House, 1976). Swords & Sorcery collects eight stories, half of which are from Weird Tales. Those four weird tales are from the 1930s, what you might call the golden age (or perhaps the only age) of heroic fiction in the magazine of the same name. By 1940, Howard and Lovecraft were in their graves, while C.L. Moore had moved on to other markets. Only Clark Ashtom Smith remained, though he wrote considerably less for Weird Tales than he had in the '30s. I think I read that Dorothy McIlwraith didn't care for heroic fiction, hence Fritz Leiber was forced to look elsewhere for a publisher of his Fafhrd and the Gray Mouser stories. Henry Kuttner, who had taken up the mantle after Howard's death (and infused a little Lovecraft into his stories) sold stories to Dorothy McIlwraith's Weird Tales, but like his new wife--that same C.L. Moore--found other markets during the 1940s. 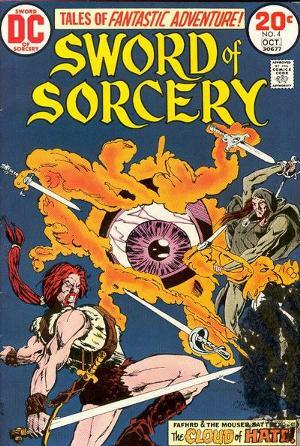 De Camp wrote an introduction to Swords & Sorcery as a whole and to each story. Virgil Finlay's illustrations appear on the cover and in the interior. Swords & Sorcery (Pyramid Books R-950, 1963), with cover art and interior illustrations by Virgil Finlay. 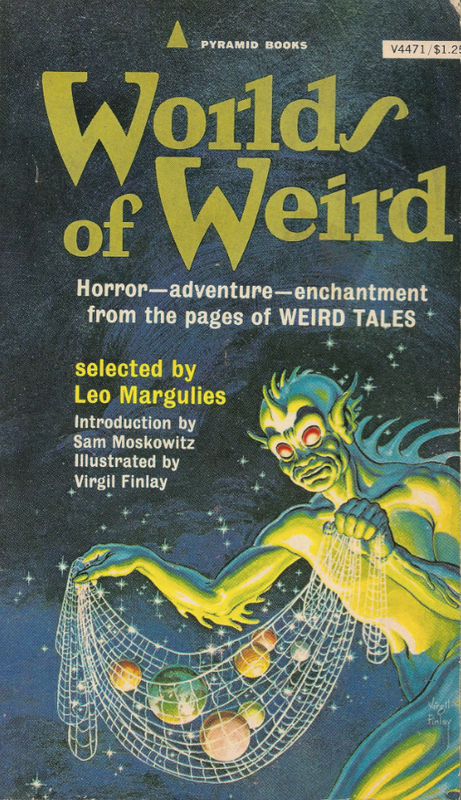 In Worlds of Weird from 1965, Leo Margulies added an introduction from science fiction historian Sam Moskowitz and interior illustrations by Virgil Finlay. As with Weird Tales (1964), the cover was also by Virgil Finlay. In his introduction, Moskowitz related the story of Jacob Clark Henneberger, founder and publisher of Weird Tales. There are seven stories in the book beginning with Seabury Quinn's well known and much admired tale of Christmas, "Roads." Other writers include Nictzin Dyalhis, Robert E. Howard, Edmond Hamilton, Clark Ashton Smith, David H. Keller, and Frank Belknap Long. The women are still absent as is H.P. Lovecraft. Three stories in this collection repeat the standard Weird Tales construction for titles: "The _____ in the _____," or "The _____ of the _____." Lovers of pulp fiction wonder why their favorite genres are not taken very seriously by literary critics. Reliance on clichés is one of the reasons. Worlds of Weird (Pyramid Books V4471, 1965, second printing, 1977), with cover art by Virgil Finlay. Pulp magazines spawned paperbacks and comic books, thereby spelling their own doom. From the early 1940s onward, pulp magazines slowly sank as readers turned to paperback books and comics for entertainment, mostly in the same genres of science fiction, fantasy, horror, and so on. When Leo Margulies acquired the Weird Tales property in the 1950s, he also acquired the rights to (or at least direct access to) a large body of material. Rather than let those old stories molder away in brittle and yellowing magazines, Margulies compiled and edited a number of paperback collections in the 1960s featuring stories from the original Weird Tales. Those collections were more or less smaller versions of the magazine, but without the ads, the letters, and the run-of-the-mill stories. I'll show four paperback collections over the next few days, beginning with a book drawn entirely from "The Unique Magazine," right down to its title. Issued by Pyramid Books, Weird Tales features cover art by Virgil Finlay and eight stories from some of the magazine's most admired authors. Margulies introduced each story, beginning with Edmond Hamilton's darkly comic "The Man Who Returned" and ending with one of the scariest tales you're likely to read, Robert E. Howard's "Pigeons from Hell." 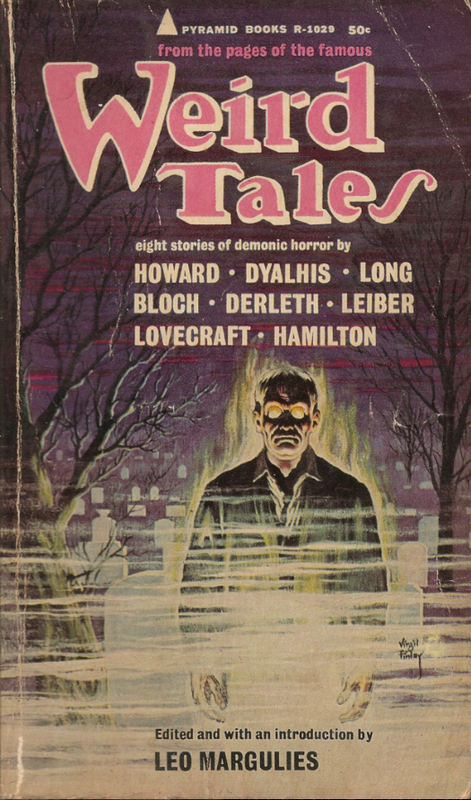 Also in the mix: Leiber, Bloch, Dyalhis, Lovecraft, Derleth, and Long. Missing are C.L. Moore and Clark Ashton Smith, but Margulies corrected that oversight in later collections. I should mention that Nictzin Dyalhis' story "The Sea Witch" (also spelled "Sea-Witch") is justly included in this collection, as it is probably his finest story and one of the most admired of all stories published in the original Weird Tales. Weird Tales (Pyramid Books R-1029) with a cover by Virgil Finlay.